So you want to start out playing with GTK and Ruby but don’t know how to start? Fear not, we’re here to help you. There are a lot of examples of “Hello, World!” applications with Ruby/GTK. Well, both Ruby and GTK are great choices for building desktop applications. The first one is a dynamic language with amazing features like closures, and of course, with an extensive built-in library. The second one is a widely used GUI framework, with lots of helpful widgets and also a great library for printing, displaying videos, playing sounds, etc. Combine these two elements and you have Ruby/GTK, a great framework… uhmmm… framework? Let me ask you a few questions. Suppose you’re starting a new desktop application in Ruby/GTK, a really big one, with lots of use cases and small details. How would you layout your directory structure? What if you needed to customize the style of a button, or change the background color of a TextView? What if your application is a kind of server, and you want some message displayed every time an user connects to it? What if you wanted to change the status bar message, and also add an icon for the client in an IconView? Let’s see it in action with a simple Hello World application. If you click in the button you should see the top label changing. How did this all worked? As you can see, the first thing we do is to load the config/environment.rb file. This will initialize the RuGUI application with the default environment—development. You could’ve specified a different environment by setting the RUGUI_ENV environment variable. This initialization process is very similar to the Rails initialization process, it was mainly copied and adapted from it. Next we instantiate the MainController and call its method run. Simple isn’t? Now to the MainController. What is it again? Unlike web applications, all desktop applications have a concept of a main loop. Basically, the application is set up before it is actually displayed. It then enters an infinite loop, which is responsible for displaying widgets and firing events as they happen (button clicks, keys pressed, network data, printing operations, etc). These events may alter the widgets visual, change data, or any other thing you might want them to do. So RuGUI’s MainController is the actual programming starting point of your application. Something like the root of your application. Better yet, all other controllers are children of this MainController, or children of controllers which are themselves children of this MainController. This is getting a little complicated, but in time you will get it. It set up the main view and add a handler for the main window delete event, which is used to quit the application. This event handler is configured in the main_view.glade file. 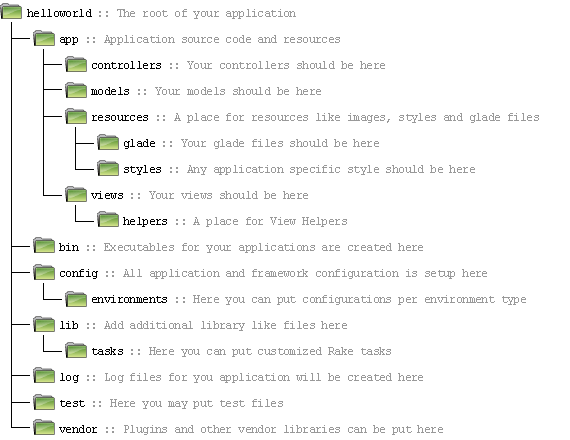 Every controller can observe events configured for widgets in glade files of all views registered for it. All named widgets created in glade files have read accessors for them. The view itself is also an observer for event handlers of its widgets. The clicked event handler for the hello_button could have been declared in the controller, but we’ve decided to declare it here to show this. This is basically all there is to it! But hey, I can do this with fewer lines! But then, you will surely get a big headache when you need to add more functionality to the application. RuGUI tries to help you by letting you separate your application in well defined layers, each with his own responsabilities. This way its easier to make your application evolve without having maintainence problems. Getting excited? Try it out now! Posted by Vicente Mundim on Wednesday, January 28, 2009, at 3:50 pm. Filed under Tutorials. Tagged gtk, ruby, RuGUI, Tutorials. Follow any responses to this post with its comments RSS feed. You can post a comment or trackback from your blog. I just discovered RuGUI and I love the rails concept. I’m checking it out for my desktop app right now! I’m looking forward to a robust RuGUI community. Are there anymore tutorials to come? I appreciate an hints to get it work.